This is the third and final article of the series. Part I provided background for this thought exercise and identified the size of the hole the 76ers had to climb out of to make the playoffs. Part II addressed the path an expert might take to arrive at his or her opinion. This part addresses the implications of the thought exercise on valuation-related Daubert challenges. It may appear that an opinion related to the 76ers’ chances of making the 2015-16 playoffs has no bearing on valuation-related (or other) Daubert challenges. However, there are other reasons why an opinion related to the 76ers’ chances of making the 2015-16 playoffs has a direct bearing on valuation-related (and other) Daubert challenges. Our expert arrived at an opinion that is diametrically opposed to contemporaneous views and many would say his or her opinion is inconsistent with common sense too. 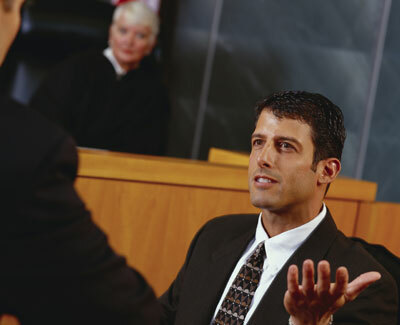 The article crystallizes the issues a valuation expert may confront offering testimony. This article is comprised of three parts. Part I provided background for this thought exercise and identified the size of the hole the 76ers had to climb out of to make the playoffs. Part II addressed the path an expert might take to arrive at his or her opinion. This part addresses the implications of the thought exercise on valuation-related Daubert challenges. It may appear that an opinion related to the 76ers’ chances of making the 2015-16 playoffs has no bearing on valuation-related (or other) Daubert challenges. Assessing a team’s playoff chances is not the same as valuing a company or most other issues where financial expert testimony is required. The analysis is also based on employing a strategic option (i.e., cash in trade chips to benefit the current team) that is not available when valuing most companies or other contexts that require financial expert testimony. It is for reasons such as these that the analysis discussed in the first two parts of this article may be irrelevant for other Daubert challenges. However, there are other reasons why an opinion related to the 76ers’ chances of making the 2015-16 playoffs has a direct bearing on valuation-related (and other) Daubert challenges. Our expert arrived at an opinion that is diametrically opposed to contemporaneous views and many would say his or her opinion is inconsistent with common sense too. Our expert’s opinion is either the product of: 1) a reliable methodology with reasoned assumptions; or 2) a series of choices (including which methodology to use) where our expert placed his or her thumb on the scale to arrive at a conclusion consistent with his or her client’s objectives. It is for reasons such as these that the analysis discussed in the first two parts of this article may be very relevant for other Daubert challenges. The dichotomy between views regarding the 76ers’ chances of making the 2015-16 playoffs may be similar to the range of views in certain valuation-related disputes. The 76ers example suggests one expert believes the 76ers will be among the worst teams in history whereas the other expert believes the team will execute the greatest in-season turnaround in history. This massive chasm in opinions may be similar to valuation disputes where one expert arrives at a very high value whereas the other expert arrives at a very low value. For example, one expert may value a company at $100 million whereas the other expert values the same company at $10 million. The 10x difference in proffered business valuations in a valuation-related dispute may be the same order of magnitude as the divergent opinions regarding the 76ers’ expectations of qualifying for the 2015-16 playoffs. The first two parts of this article showed how two experts can arrive at starkly different conclusions regarding expectations for the 76ers. This article shows how two experts can arrive at a similar disparity between conclusions in a valuation-related dispute. The second expert will not agree with any of these assumptions. We will first assume that s/he believes the discount rate is too low. 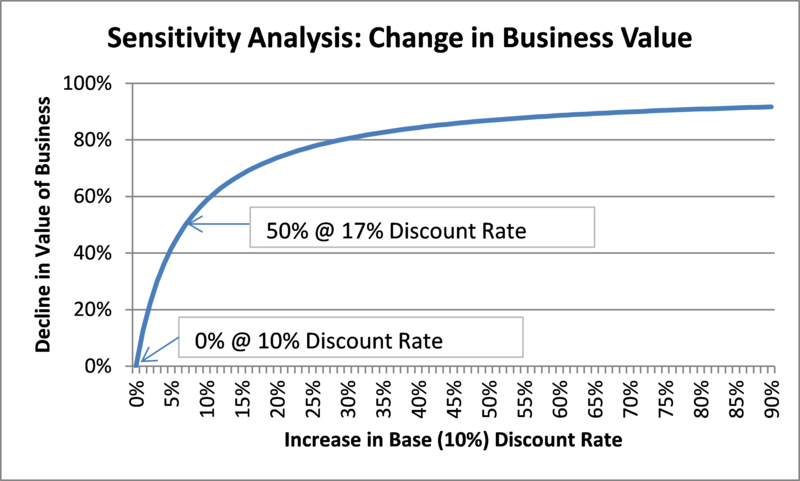 As shown in Figure 1, increasing the discount rate by just a few percentage points results in a large decrease in value. Opposing experts can arrive at very different discount rates. For example, the first expert may use a 10% discount rate, whereas the second expert uses a 17% discount rate. This gap may be due to differences in beta, capital structure, cost of debt, equity risk premium, size premium, or company specific risk premium. 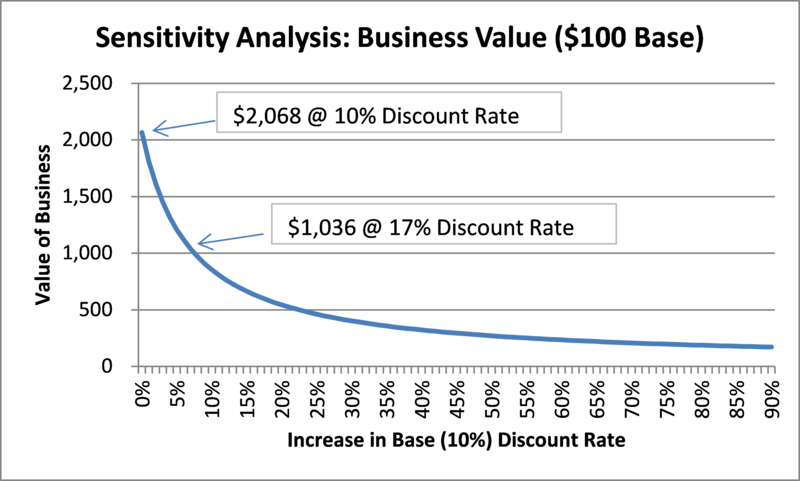 As shown in Figure 1, the first expert, who uses the 10% discount rate ($2,068), arrives at 2x the value as the second expert that uses the 17% discount rate ($1,036). The opposing experts may disagree on the base level of cash flow too. For example, the first expert may believe that $100 is appropriate, whereas the second expert believes the base level should be reduced by 60% to $40. These experts are disagreeing over the size of this company’s foundation for generating future cash flow. Perhaps one expert focuses on recent past performance, whereas the other expert assumes the future will be very different than the recent past. 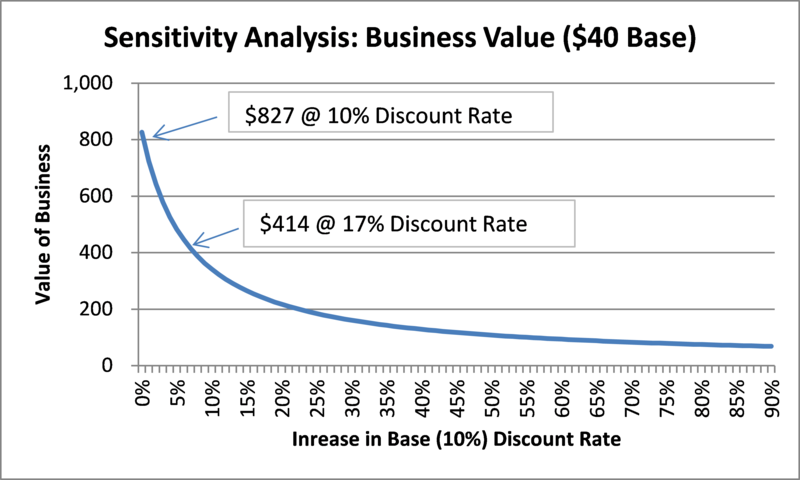 Figure 2 shows the effect of combining both changes: reduce base cash flows from $100 to $40 and include a range of higher discount rates. The reduction in base cash flows causes a shift in the curve because the value under each discount rate is reduced by the same amount. The expert using the $100 base arrives at 2.5x greater values than the other expert who uses the $40 base. The chasm between the two experts has widened. 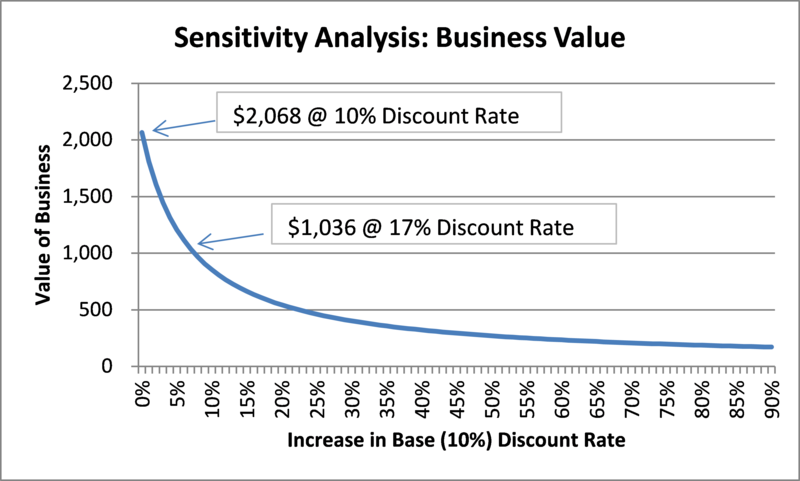 The discount rate difference (10% vs. 17%) resulted in a 2x difference in values ($2,068 vs. $1,036). Overlaying the base cash flow difference ($100 vs. $40) increases the difference in concluded values to 5x ($2,068 vs. $414). The opposing experts may disagree on the growth rates too. For example, the first expert may believe that 10% growth for the first five years and 3% into perpetuity is appropriate, whereas the second expert believes the growth rates should be a 3% decline for the first five years and into perpetuity. The first expert’s opinion is consistent with a business that grows for five years and then stays about the same size in inflation-adjusted terms thereafter. The second expert’s opinion suggests the business will decline in inflation-adjusted terms and by a greater extent in real terms into perpetuity. 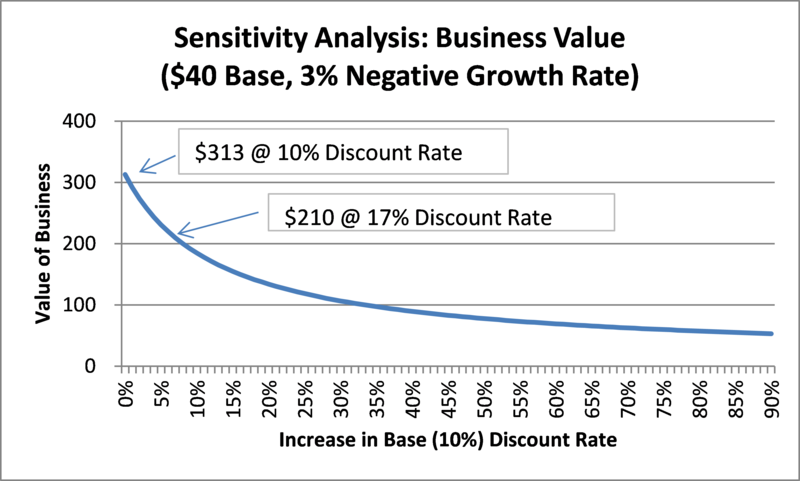 Figure 3 shows what happens to the value when all of the changes are made: lower growth rates, reduce base cash flows from $100 to $40, and include a range of higher discount rates. The gulf between the two experts widened again. 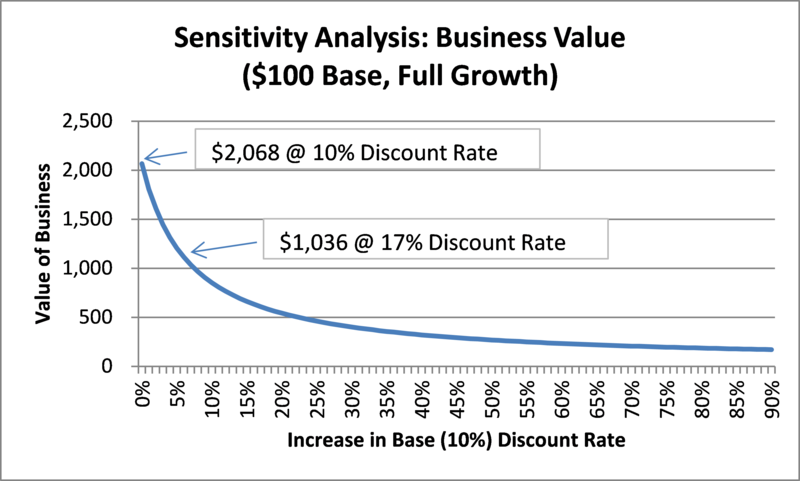 The discount rate difference (10% vs. 17%) resulted in a 2x difference in values ($2,068 vs. $1,036). Overlaying the base cash flow difference ($100 vs. $40) increased the difference to 5x ($2,068 vs. $414). Overlaying the growth rate difference (10%, 3% vs. -3%, -3%) further increases the difference to approximately 10x ($2,068 vs. $210). The range of opinions is quite wide in both instances addressed in this article. The 76ers range from being expected to be the one of the worst team in league history to executing the greatest in-season turnaround in league history. The valuation dispute has one expert arriving at 10x the opposing expert’s valuation, which is similar to a seller asking $1 million for a house and a buyer offering only $100 thousand. The path to the wide range of opinions is also similar in both instances addressed in this article. The 76ers analysis is based on three key assumptions (threshold for making the playoffs, number of wins generated by status quo team, and number of wins obtained from new players in trades). The valuation dispute is also based on three key assumptions (base level of cash flows, growth rates, and discount rates). It is not clear if the expert’s conclusions for each of the key assumptions are in the same direction and order of magnitude. One could argue that the expert who said the 76ers were expected to make the playoffs consistently made aggressive decisions that skewed the conclusion. A similar argument would apply to the valuation-related dispute if one expert consistently skewed the analysis in one direction or the other. The debates over methodology may be similar too. The 76ers debate focused on how to value players. The intrinsic value for the players acquired in trades (Isaiah Thomas and Hassan Whiteside) under the win share methodology is greater than these players’ values based on other methodologies (e.g., the market approach based on their contracts). A similar gap may exist in the valuation-related dispute as one of the expert’s valuations is presumably much closer to the value implied by other methodologies (e.g., the market approach based on guideline companies) than the other expert’s valuation. On the one hand, it seems that an expert can potentially arrive at virtually any conclusion s/he wants and survive a Daubert challenge by cloaking it in a methodology deemed reliable enough for Daubert-related purposes. As demonstrated in the 76ers example, an opinion diametrically opposed with contemporaneous market participants’ view can be shown to be the product of a reliable methodology. It is perhaps for this reason that both valuations in the example discussed in this article could survive a Daubert challenge. I have seen examples like this in fraudulent conveyance lawsuits where the binary nature of the analysis (the debtor is either solvent or insolvent) lends itself to wide disparities in proffered valuations. On the other hand, no reliable methodology is infallible. Practitioners often use the phrase “garbage in/garbage out” when an otherwise reliable methodology produces an unreliable result. Some Daubert challenges presumably weed out examples of “garbage in/garbage out.” However, other Daubert challenges may not weed out these examples or throw the proverbial baby out with the bathwater by excluding testimony that should not be excluded. I do not know the definitive implication of the 76ers thought exercise on valuation-related or other disputes. My goal in this article is to demonstrate the wide range of outcomes that can be produced from methodologies that might be deemed reliable. Some of these outcomes seem to be ripe for a Daubert challenge, while others are best addressed at trial.